During the last year I've conducted a bushcraft knife field test including 15 different robust knives. You can see the test by clicking HERE. One of the test knives was the Buck 679 BuckLite Max Large Knife. Even if it's the classic hunting knives from the 60's (the Buck 110 Folding Hunter and the Buck 119 Special) that's most recognized among people; The Buck Knife company history reaches back to as long as the year 1899 when the founder Hoyt H. Buck 10 years old started his training as a blacksmith in Kansas USA. In 1902 the young Mr. Buck invents his own method of forging his blades to a higher capacity. Business took off and in 1949 when the well known knife maker Hoyt passes his son Al Buck continues his fathers legacy up until it was passed on again to Al's son Chuck Buck in 1991. Since then Chuck and his son CJ Buck together with Paul Bos have been keeping the family business going. From the start Buck's knife blades was made from stainless 440C steel, in 1981 this was replaced by the 425M steel and since 1991 the Buck blades comes in the well known stainless 420HC steel. This knife is an excellent hunting knife with it's nice rubber grip and easy cleaned sheath. But the 679 is also a pretty decent bushcraft knife. The full tang offer a strong yet slim handle and the stainless hollow grind drop point blade offer a sturdy 2,8 m thick and 99 mm long blade. The knife is offered in two colors; black and orange, with or without a gut hook. The black polyester sheath isn't the most beautiful but it gets the job done. To bad the sheath don't come with a drainage hole. The Buck 679 is a hunting knife that works pretty good in most tasks; fishing, tactical (preferably with a custom sheath) and bushcraft. And all of this for a reasonable price. I got this knife on a sale for 200 SEK. Regarding my bushcraft knife field test; the Buck 679 ended up at 15th place even though the thin and short blade are features I really like. The reason for this result is the asymmetric shape of the knife that works great for taking care of game, but is hard to get used to when whittling. 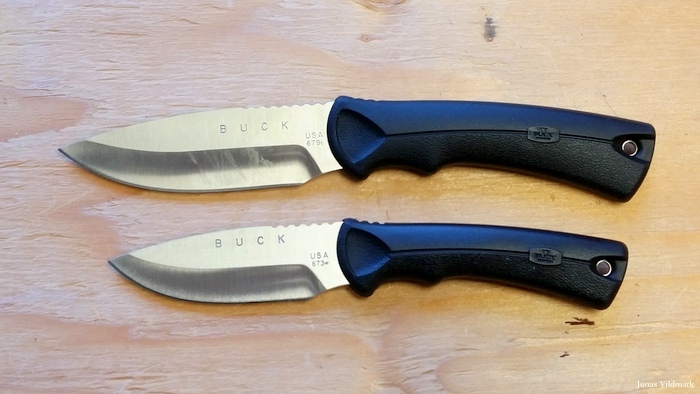 I also really like the smaller sibling; the Buck 673 BuckLite Max Small Knife for when out hunting. A smaller 20 mm shorter version of the Large. During my bushcraft knife test Buck Knives launched a new interesting product; the Buck 863 Selkirk Knife; a pure bushcraft knife that I'm looking forward testing in the near future. I Like the Buck 679 therefor it hurts me a bit to see it last in my bushcraft knife field test. But all 15 test knives were great and someone has to come last. I'm Looking forward to continue bushcrafting with this slick knife, especially while hunting and fishing.